B Stigma-Free is bringing together various people, groups and organizations to address the underlying causes of prejudice. In 2015 we coined the term Cross-Identity Collaboration™ to describe our methodology. 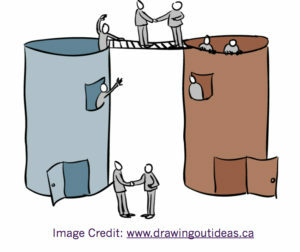 We help organizations overcome the challenges of reaching like-minded audiences by building bridges, establishing new collaborations to reduce social stigma, and consequently bias and discrimination. Working together, our message of compassion and understanding is cross-pollinated, helping folks better relate to one another, and forging acceptance and respect. Using sound, peer-reviewed research and proven successful strategies for coalition building, we are focusing on commonalities and building effective teams. We ask stakeholders about gaps in services, and seek inclusive ways to address these. We spend time learning about organizations’ cultures, and get to know their leadership. Not wanting to duplicate services, we continually seek to maximize resources to yield the most efficient and successful methods to form inter-organizational collaborations. Lasting change doesn’t come from the top-down. In addition to building partnerships with national leadership organizations, we are fostering local, grassroots movements. Our team supports individuals and groups who want to engage their local communities by providing leadership development and fostering interdependent community-based coalitions. We provide training, technical assistance and website hosting to help build sustainable coalitions comprised of action-oriented leaders. We believe that by bringing together people where they live, and how they live, we will promote communication and action.